Threespot Angelfish feeding in an aquarium. The Threespot or Flagfin Angelfish, Apolemichthys trimaculatus, does not commonly do well in captivity, unless the aquarist is willing to spend time housing it properly and getting it to feed. Lots of mature live rock is a necessity with algae, tunicates and sponges growing on it. This will enable them to feed off these natural foods on the rock until they can be coaxed into eating prepared foods with sponge material. Do not keep with boisterous feediers or any aggressive fish since it will hide, not feed and starve to death. They are bullied by dwarf angelfish. Provide a tank that is at least 100 gallons and plenty of hiding places. Video of adult Bluefaced Angelfish with close up video of face and backside. They are more peaceful than other Poms but will still go after smaller peaceful fish. They are not reef safe and will snack on more corals. They grow to 15" and need a minimum tank of 125 gallons, but 225 gallons is best before they are adults. They will live over 21 years in captivity and will eat most prepared foods. Shows two Lamarck's Angelfish with one starting to show signs of becoming a male. Indian Yellow-Tail Angelfish chillin' in a captive reef. The Indian Yellow-Tail Angelfish (Apolemichthys xanthurus) also known as the Cream Angelfish or Smoke Angelfish. A hardy peaceful addition to your marine aquarium! The angelfish in this video is housed in a peaceful tank and looks quite fat and happy! They grow to just under 6", and do adjust quite well to captive care and need a tank that is 75 gallons or more. They are one of the more hardy members of this genus and can be kept with other angelfish if it is one of the first added to the tank. They are suited to a fish only set up with algae on the live rock to graze on, but some have kept them in a reef tank with lots of corals with some success. Feed foods with sponge material and Spirulina added if there is not an ample supply of algae in the tank. Video shows yellow Herald's Angelfish, Centropyge heraldi, in among several dwarf angelfish. You can see the aggression between them which is due to the aquarium being too small. The Herald's Angelfish is not as durable as other dwarf angels, but one acclimated can do quite well if kept in a tank with a large amount of algal growth. They will pick at polyps of soft corals, large-polyped stonies, zoanthids, and clam mantles, so they would be best kept in a fish only tank. A male female pair can be kept in a tank that is at least 75 gallons or more. Here is an adult Blue Angelfish that has adapted to captivity quite well. Looks like it is eating pellet, which should have sponge material added. Video with pleasant music of a sub-adult King Angelfish in a holding tank. The King Angelfish, Holacanthus passer, has various color morphs from juvenile to adult. Adult King Angelfish will clean Hammerhead Sharks, so hey if you happen to have a tank the size of most houses, get one! Otherwise a tank that is at least 135 gallons minimum is need for proper growth for this 14" angelfish! It is odd, but large angelfish, if their growth is stunted by a small tank, will result in their death! Their organs will grown to proper size, but if the body does not make it to the correct length, these organs are in essence are crushed, leading to death in about a year or so. Queen Angelfish hanging out with a YellowTail Damselfish in the wild. Picture of adult in dealers tank. Good quality film, but sad the fish has no place to hide. Saltwater Angelfish are truly an aquarist's inspiration, few fish rival their beauty and majesty! Marine Angelfish are remarkable creatures and some of the most alluring of all fish. They have an elegant form, graceful movement, and often display beautiful vibrant colors. Their bodies are compressed laterally, a flat disc-like form that allows them to slip between rocky outcroppings and reef crevices. They come in all shapes and sizes, and although they can be very showy, their coloration actually helps them blend with the patterns and shadows of the reef. Saltwater angelfish vary considerably in their care requirements, and with wild caught specimens, acclimating them to the aquarium can be a challenge. Yet once established they are relatively hardy, making these exquisite specimens highly desirable. Angelfish do tend to become very territorial as they mature, so it is generally recommended to keep only a single specimen. Many feed only on sponge and tunicate, and adult specimens may become destructive to a reef. There are prepared angel formulas containing sponge, but it can often be difficult to get an angel to accept new foods. However once an angelfish is feeding it can live for many years. An example is the aquarium in Nancy, France, which has successfully kept several specimens of saltwater angelfish for over 20 years. The list of saltwater angelfish below include many aquarium fish species. Each fish guide has in-depth angelfish information about their places of origin, habitats and behaviors as well as the fish care needed for successfully keeping angelfish aquariums. Angelfish pictures are also provided within each fish guide to help with saltwater fish identification, and aid in choosing pet fish. Saltwater Angelfish are found on shallow reefs in the tropical waters of the Atlantic Ocean, Indian Ocean, and Western Pacific Oceans. The majority of the angelfish species are found in the Western Pacific, only nine species are found in the Atlantic and as few as four in the Eastern Pacific/Indian Ocean areas. The family Pomacanthidae, angelfishes, consists of 9 genera containing approximately 87 species of saltwater angelfish. They are distinguished from the similarly shaped butterflyfish by strong preopercle spines found on each of the lower gill covers of the angelfish. For the most part, marine angelfish dwell among shallow reefs. They are diurnal, moving about and feeding during the daytime, and at night seeking refuge among crevices in the reef and rocky outcroppings. Many are solitary, but some are found in pairs, or living in small groups or harems consisting of a dominant male and several females. These fish are pelagic spawners. They release many tiny eggs into the planktonic water column where they float with the currents until they hatch. Saltwater angelfish are very colorful and come in many sizes. As juveniles they can have a different coloration than they do as adults. These fishes are also protogynous hermaphrodites, meaning they begin their life cycle as females with dominant specimens turning male. Males can also revert back to female if the social status changes. Many of the adult angelfish become territorial as they grow older and it is thought that perhaps the different coloration among the younger fish keep them from being the target of the older fish's aggression. Another interesting tidbit, some angels are also known to perform cleaner fish duties as juveniles. Size wise, angelfish range from about 4 inches (10 cm) to 24 inches (60 cm) in the wild. The smallest species, those known as the Dwarf Angel or Pygmy Angel, only reach up to about 6" (15 cm). Other species are medium sized to quite large, with the largest angelfish reaching about 24" (60 cm). Marine angels all have small mouths and tail fins that are crescent-shaped, or lunate. Many angels have decorative streamers that extend from the outer tips of the tail fin and the dorsal fin. Saltwater angelfish are very similar to the equally showy butterflyfishes. But angels are distinguished by their strong preopercle spines found on each of the lower gill covers, which are lacking on the butterflyfish. They are members of the Pomacanthidae family, a descriptive name for these preopercle-spine fish derived from the Greeks, with "Poma" meaning cover and "akantha" meaning thorn. Angelfish are members of the Perciformes Order, the perch-like, Ray-finned or Bony Fishes. This order of fishes originated more than 65 million years ago during the Late Cretaceous period, also a time of the dinosaurs. Perciformes are comprised of more than 7000 species of fish with about 155 families. The Saltwater Angelfish belong under the Pomacanthidae Family, which consists of 9 genera containing approximately 87 saltwater angelfish species. 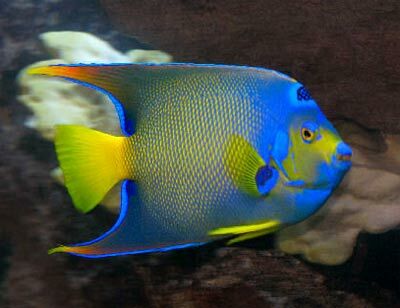 Saltwater angelfish are prized for their unique shape and exotic colors. They are also favored for their intelligent behavior, seeming to recognize their owner. Yet successfully keeping angelfish aquariums depends on a number of factors. It's important to select the right angelfish for your particular tank size and set-up, and provide the right foods for that particular species. Many angelfish are not considered reef safe. Tank mates must also be compatible. Angelfish are grazers, constantly looking for food. Depending on the species, some will snack on micro and filamentous algae, and some will nibble on macro algae. They are best introduced into an established saltwater aquarium, and one with good algae growth. Live rock housing small crustaceans is also beneficial. Angelfish must be willing to accept new foods in their diet in order to survive in an aquarium and are therefore considered difficult to keep. Feeding a large variety of foods is important in order to entice them into eating. Once feeding is accomplished, they can survive for long periods of time in captivity. Most angelfish, except the Pygmies (Centropyge) are sponge and tunicate eaters. This makes them hard to acclimate since these foods are generally not included in prepared fish foods. Several sponge-based frozen foods are now available and should be fed to certain angelfish especially those of the genus Holocanthus. The smaller angelfish species are popular with many aquarists because they require less space and are relatively hardy. Many of the smaller angels (Centropyge) can be housed in a reef but may become destructive with age. Larger angelfish, on the other hand can provide a very impressive showcase but require a much larger tank, and many are very territorial and aggressive fish. Centropyge - The Dwarf/Pygmy Angelfish, rarely get to be over 10 cm. (4 inches) but are very beautiful and adapt well to aquarium life. In the wild they eat mostly algae. Apolemichthys - In the wild these angels eat mostly sponges and tunicates. Plankton eaters. Chaetodontoplus - In the wild these angels eat mostly sponges and tunicates (sea squirts). Holacanthus - The King and Queen angelfish are the best known examples of this genus, they generally eat sponges and therefore are more difficult to keep healthy in an aquarium. Pomacanthus - In the wild these angels eat mostly sponges and tunicates. Plankton eaters. Saltwater Angelfish are territorial and can be very aggressive fish. These fish will quarrel with their own species, and most often will not tolerate any other species. There are different levels of aggression, depending on the species, but it is generally it is best to keep just a single specimen. When combining different types of fish, try adding the angelfish last. Introducing new fish to an established community can cause territorial disputes. Small Dwarf Angel or Pygmy Angels, Centropyge species, can do well in a community fish tank with other non-aggressive fish. Some of the medium sized angels, like those from the Chaetodontoplus and Genicanthus genera, and a few others mid-sized species are also suited to a community setting. Tank mates that do well with these marine angels include Butterflyfish, Anthias, Gobies and Blennies, and similar non-related species. Larger saltwater angelfish, notable those from the Holacanthus and Pomacanthus genera, are territorial and more aggressive. They should be housed with other fish that also have a more aggressive temperament. Damsels, Triggerfish, Hawkfish, Tangs, Groupers and Eels can make good companions.